The sixth annual She Rocks Awards rocked the House of Blues Anaheim on January 26, 2018. 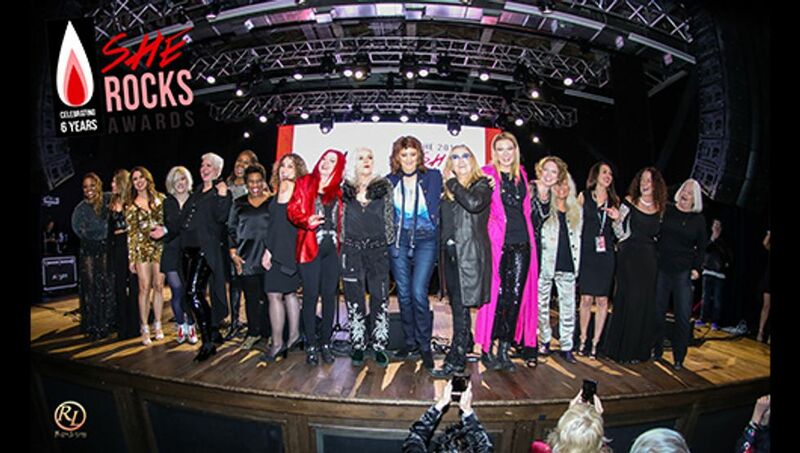 Hosted by the Women’s International Music Network (the WiMN), the gala celebration featured a star studded array of honorees that included Melissa Etheridge, Kate Pierson & Cindy Wilson of The B-52s, Exene Cervenka of X and members of the pioneering all-female rock band Fanny, as well many other women from all corners of the music and audio industry. Featured performers Command Sisters delivered an upbeat B-52s medley that had the house singing along. The evening also included the premiere of a new song by WiMN founder Laura B. Whitmore and recording artist Jenna Paone called, “Just a Girl,” along with a moving video that delivered a message encouraging girls to dream big. Laura B. Whitmore co-hosted along with Kat Corbett of LA radio station KROQ. Other highlights included a fantastic performance of the Etheridge hit “Come to My Window” by Laura Clapp, and Olivia Rox’s rendition of the Pat Benatar anthem “Invincible.” Alaska Reid of Alyeska interpreted X’s hit “Breathless” with sultry abandon. Members of the pioneering rock band Fanny shared their new project, Fanny Walked the Earth, with a preview of their upcoming 2018 release. The rousing finale brought together members of Fanny, The B-52s, Melissa Etheridge and performers Olivia Rox, Jenna Paone, Laura Clapp and Sabrina Lentini to deliver an inspired performance of “Respect.” The song, made famous by Aretha Franklin, but written by Otis Redding (whose daughter, Karla Redding-Andrews, was also honored during the event), was an energetic ending to a moving evening. Find out more at sherocksawards.com.